Just before leaving France, I made sure not to miss the much-discussed Jeff Koons exhibit at the Château de Versailles. For the most part, the French claim loudly to hate the placement of the work throughout the palace, calling it a disgrace (but five years from now, they'll be applauding themselves for doing it). There were even signs warning tour guides not voice their personal opinions of the work to their groups. But I heard guides claiming the work an embarrassment. An insult. One guide was particularly vexed that Koons, "This...this...megalomaniac artist from New York..." she stammered disdainfully to her group, had dared to place a marble bust of himself in the king's throne room. Hm. Let's see. A marble bust to oneself in Versailles. Clearly out of context and lacking any relevance to the venue. Versailles is a concentration of excellence and perfection, but it is also a living object. Inviting a contemporary artist encourages people to look beyond the decor. It sharpens the eye. Our modern culture has taught us to transcend centuries and cultures. On the same day, you can listen to Monteverdi, Christophe and pygmy chants, and it all exists together in our sensibilities. These confrontations are a fabulous opportunity escape from the very worst thing: certainty and habit, which make us lazy in our taste and lower our intelligence. The tourist will be delighted, because everything will be there, they will see it from another angle. 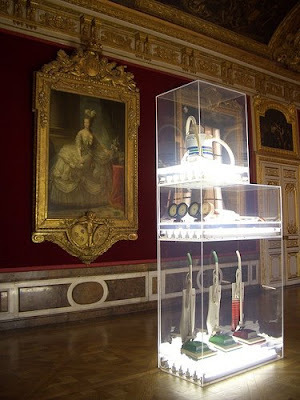 Versailles is a contemporary work...Versailles itself is a collage from the 17th to the 19th century. Today, we think that it is complete ad vitam eternam. But it must continue to fuel our intelligence. I loved it. It was relevant, playful, beautiful, sometimes ugly, and enhanced both Versailles and Koons' work in ways I'd never seen either before. Some works were gross juxtapositions, others blended in perfectly, and I nearly overlooked their presence. I think what I enjoyed most was knowing that thousands of people who had never previously heard of Jeff Koons, or might not bother going to look at contemporary art, were now exposed to it and part of the discussion.